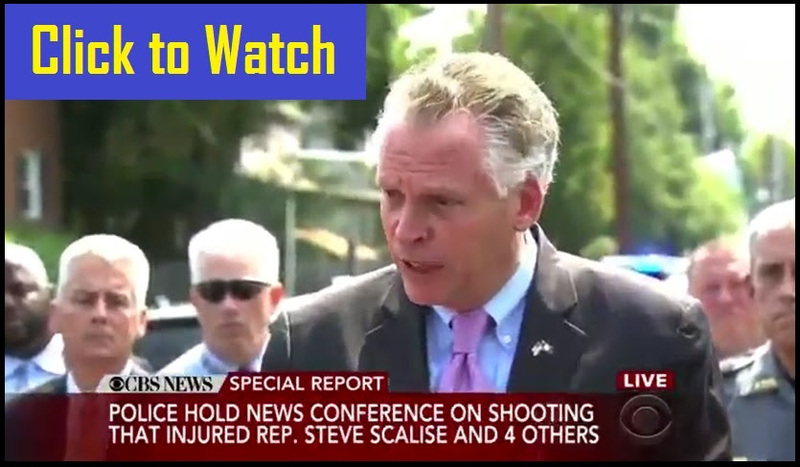 In the wake of today’s assassination attempt in Washington D.C., gun-control advocates like Virginia Gov. Terry McAuliffe are already trotting out the predictable demand for more gun control. Never mind the fact that the shooter already had passed a background check in his home state of Illinois — proving how worthless those checks are in the first place. Never mind the fact that study after study shows us that violent crime always decreases when gun rights are expanded. And never mind the fact that almost every mass-shooting takes place in “Gun Free Zones” — where anti-gun legislators have made it impossible for law-abiding citizens to own and carry firearms for self-defense. No, before the blood of the wounded is even dry, gun-control advocates are already trying to seize the momentum. I don’t know about you, but I am sick and tired of gun-control advocates using the results of their own failed policies as ammunition to try to implement even more gun control! Of course, you’ll hear almost nothing in the media about the fact that the shooter was a volunteer on the Bernie Sanders campaign right here in Iowa last year. And don’t be surprised if you don’t see national media outlets telling you that the shooter — before launching his attack — confirmed with witnesses that the baseball stadium he was entering was where the Republicans were practicing. Gun-control activists in this country are brazen and bold in their attempts to crack down on our right to keep and bear arms — and they are unwilling to compromise. Thankfully, here in Iowa, the members of Iowa Gun Owners are equally unwilling to compromise! This past legislative session, thanks to all of your support, we were able to end our six-year struggle to pass Stand–Your–Ground law! But a major fight remains, as Constitutional Carry will be our primary objective in 2018 and anti-gun legislators in Des Moines are opposed to this more than anything else! In fact, they said so publicly as, time and again, they thanked Republican leadership for removing Constitutional Carry from this year’s omnibus bill. Undoubtedly, they will use the events of today as more fodder for their smear campaign as they work to stop Constitutional Carry. That’s why I hope you will get involved with Iowa Gun Owners today, if you are not already a member! And we never apologize for being proud gun owners! So whether you can join as a lifetime member as some generous supporters have done, or whether a basic membership is more appropriate for you at this time — please get involved in this fight! I can assure you that anti-gun activists in Des Moines, their pals in the media, and all-too-many weak kneed pro–gun legislators are not going to pass Constitutional Carry law without a fight. Please stand with us, as we unapologetically continue the fight for the Second Amendment here in Iowa! And whatever you do, please take a moment to pray for all the victims and their families who are recovering from this act of political violence. P.S. In the wake of this morning’s political assassination attempt in Washington D.C., gun-control advocates are calling for even more gun control, as you’ll see in the video above. That’s right, before the blood of the victims is even dry, anti-gunners are trying to mobilize. Please support the Second Amendment and stand up against these unhinged gun control activists by joining Iowa Gun Owners TODAY! Tagged Bernie Sanders, Gun Control, Gun Free Zones, Virginia Gov. Terry McAuliffe, Washington D.C.